This Website is offered and available to users who are 21 years of age or older and reside in the United States or any of its territories or possessions. By using this Website, you represent and warrant that you are of legal age to form a binding contract with Dowsett and meet all of the foregoing eligibility requirements. If you do not meet all of these requirements, you must not access or use the Website. The Website and its entire contents, features and functionality (including but not limited to all information, software, text, displays, images, video, and audio, and the design, selection, and arrangement thereof), are owned by Dowsett, its licensors, or other providers of such material and are protected by United States and international copyright, trademark, patent, trade secret and other intellectual property or proprietary rights laws. 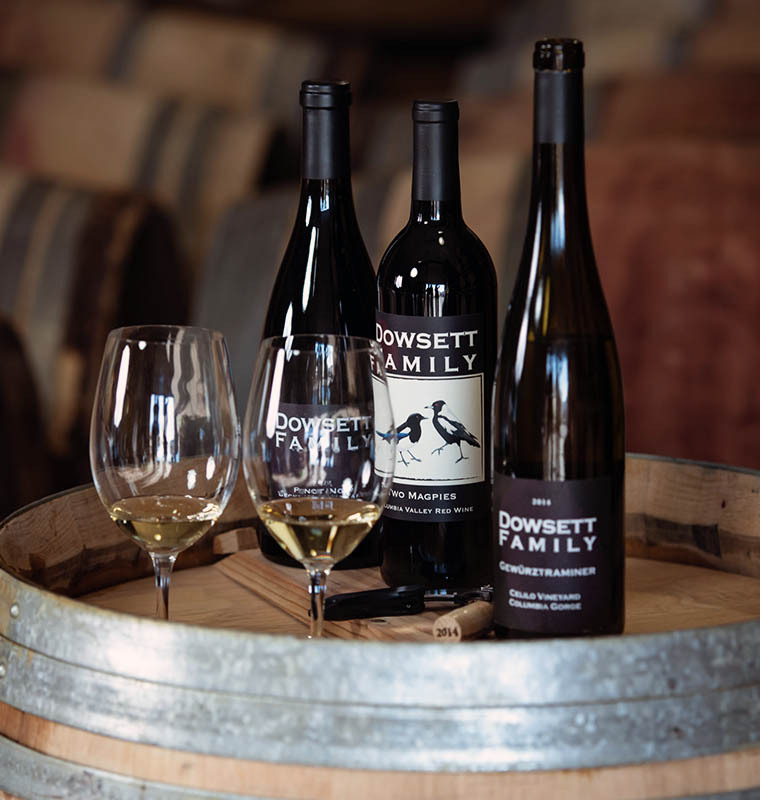 The Dowsett Family LLC name, the terms DOWSETT FAMILY, DOWSETT FAMILY WINES, and all related names, logos, product and service names, designs, and slogans are trademarks of Dowsett. You must not use such marks without the prior written permission of Dowsett. All other names, logos, product and service names, designs, and slogans on this Website are the trademarks of their respective owners. To impersonate or attempt to impersonate Dowsett, a Dowsett employee, another user or any other person or entity (including, without limitation, by using e-mail addresses associated with any of the foregoing). To engage in any other conduct that restricts or inhibits anyone’s use or enjoyment of the Website, or which, as determined by us, may harm Dowsett or users of the Website or expose them to liability. The Website may contain blogs and product profiles that allow comment or other interactive features (collectively, “Interactive Services”) that allow users to post, submit, publish, display or transmit to other users or other persons (hereinafter, “post”) content or materials (collectively, “User Contributions”) on or through the Website. Any User Contribution you post to the site will be considered non-confidential and non-proprietary. By providing any User Contribution on the Website, you grant us our licensees, successors and assigns the right to use, reproduce, modify, perform, display, distribute and otherwise disclose to third parties any such material for any purpose. You own or control all rights in and to the User Contributions and have the right to grant the license granted above to us our licensees, successors and assigns. You understand and acknowledge that you are responsible for any User Contributions you submit or contribute, and you, not Dowsett, have full responsibility for such content, including its legality, reliability, accuracy and appropriateness. Without limiting the foregoing, we have the right to fully cooperate with any law enforcement authorities or court order requesting or directing us to disclose the identity or other information of anyone posting any materials on or through the Website. YOU WAIVE AND HOLD HARMLESS DOWSETT FROM ANY CLAIMS RESULTING FROM ANY ACTION TAKEN BY DOWSETT DURING OR AS A RESULT OF ITS INVESTIGATIONS AND FROM ANY ACTIONS TAKEN AS A CONSEQUENCE OF INVESTIGATIONS BY EITHER DOWSETT OR LAW ENFORCEMENT AUTHORITIES. If you believe that any material on the Website violates your copyright, please see send us a notice of copyright infringement at [email protected]. This Website may include content provided by third parties, including materials provided by other users. All statements and/or opinions expressed in these materials, and all articles and responses to questions and other content, other than the content provided by Dowsett, are solely the opinions and the responsibility of the person or entity providing those materials. These materials do not necessarily reflect the opinion of Dowsett. We are not responsible, or liable to you or any third party, for the content or accuracy of any materials provided by any third parties. You understand that we cannot and do not guarantee or warrant that files available for downloading from the internet or the Website will be free of viruses or other destructive code. You are responsible for implementing sufficient procedures and checkpoints to satisfy your particular requirements for anti-virus protection and accuracy of data input and output, and for maintaining a means external to our site for any reconstruction of any lost data. TO THE FULLEST EXTENT PROVIDED BY LAW, WE WILL NOT BE LIABLE FOR ANY LOSS OR DAMAGE CAUSED BY A DISTRIBUTED DENIAL-OF-SERVICE ATTACK, VIRUSES OR OTHER TECHNOLOGICALLY HARMFUL MATERIAL THAT MAY INFECT YOUR COMPUTER EQUIPMENT, COMPUTER PROGRAMS, DATA, OR OTHER PROPRIETARY MATERIAL DUE TO YOUR USE OF THE WEBSITE OR ANY SERVICES OR ITEMS OBTAINED THROUGH THE WEBSITE OR TO YOUR DOWNLOADING OF ANY MATERIAL POSTED ON IT, OR ON ANY WEBSITE LINKED TO IT. YOUR USE OF THE WEBSITE, ITS CONTENT, AND ANY SERVICES OR ITEMS OBTAINED THROUGH THE WEBSITE IS AT YOUR OWN RISK. THE WEBSITE, ITS CONTENT AND ANY SERVICES OR ITEMS OBTAINED THROUGH THE WEBSITE ARE PROVIDED ON AN “AS IS” AND “AS AVAILABLE” BASIS, WITHOUT ANY WARRANTIES OF ANY KIND, EITHER EXPRESS OR IMPLIED. NEITHER DOWSETT NOR ANY PERSON ASSOCIATED WITH DOWSETT MAKES ANY WARRANTY OR REPRESENTATION WITH RESPECT TO THE COMPLETENESS, SECURITY, RELIABILITY, QUALITY, ACCURACY, OR AVAILABILITY OF THE WEBSITE. WITHOUT LIMITING THE FOREGOING, NEITHER DOWSETT NOR ANYONE ASSOCIATED WITH DOWSETT REPRESENTS OR WARRANTS THAT THE WEBSITE, ITS CONTENT, OR ANY SERVICES OR ITEMS OBTAINED THROUGH THE WEBSITE WILL BE ACCURATE, RELIABLE, ERROR-FREE OR UNINTERRUPTED, THAT DEFECTS WILL BE CORRECTED, THAT OUR SITE OR THE SERVER THAT MAKES IT AVAILABLE ARE FREE OF VIRUSES OR OTHER HARMFUL COMPONENTS OR THAT THE WEBSITE OR ANY SERVICES OR ITEMS OBTAINED THROUGH THE WEBSITE WILL OTHERWISE MEET YOUR NEEDS OR EXPECTATIONS. TO THE FULLEST EXTENT PROVIDED BY LAW, DOWSETT HEREBY DISCLAIMS ALL WARRANTIES OF ANY KIND, WHETHER EXPRESS OR IMPLIED, STATUTORY OR OTHERWISE, INCLUDING BUT NOT LIMITED TO ANY WARRANTIES OF MERCHANTABILITY, NON-INFRINGEMENT AND FITNESS FOR PARTICULAR PURPOSE. TO THE FULLEST EXTENT PROVIDED BY LAW, IN NO EVENT WILL DOWSETT, ITS SERVICE PROVIDERS, EMPLOYEES, AGENTS, OFFICERS, OR DIRECTORS BE LIABLE FOR DAMAGES OF ANY KIND, UNDER ANY LEGAL THEORY, ARISING OUT OF OR IN CONNECTION WITH YOUR USE, OR INABILITY TO USE, THE WEBSITE, ANY WEBSITES LINKED TO IT, ANY CONTENT ON THE WEBSITE OR SUCH OTHER WEBSITES OR ANY SERVICES OR ITEMS OBTAINED THROUGH THE WEBSITE OR SUCH OTHER WEBSITES, INCLUDING ANY DIRECT, INDIRECT, SPECIAL, INCIDENTAL, CONSEQUENTIAL, OR PUNITIVE DAMAGES, INCLUDING BUT NOT LIMITED TO, PERSONAL INJURY, PAIN AND SUFFERING, EMOTIONAL DISTRESS, LOSS OF REVENUE, LOSS OF PROFITS, LOSS OF BUSINESS OR ANTICIPATED SAVINGS, LOSS OF USE, LOSS OF GOODWILL, LOSS OF DATA, AND WHETHER CAUSED BY TORT (INCLUDING NEGLIGENCE), BREACH OF CONTRACT, OR OTHERWISE, EVEN IF FORESEEABLE. This website is operated by Dowsett Family LLC, 1211 Sand Pit Road, Touchet, WA 99360.